When shopping around for a certificate of deposit, options are important. Whether you’re interested in a low minimum deposit or the flexibility to change your rate, your bank should be able to accommodate your wishes. Luckily, a CD from Ally Bank can with a number of attractive features for those looking. When it comes to Ally Bank CDs, you should consider the basics. First of all, there is no minimum deposit and there are no monthly fees for maintenance, making Ally Bank CDs an attractive option for everyone. Best of all, you have guaranteed rate hikes: You’re guaranteed one rate increase on a two-year CD and two rate increases on a four-year CD when you invest in a Raise Your Rate CD. And who doesn’t like to see their money making more money for them? You can have extra peace of mind knowing that Ally Bank CDs have a ten-day best rate. Further, your earnings are maximized with Ally Bank’s daily compounded interest. While you do pay penalties for early withdrawals, you also receive automatic renewal when your CD reaches maturity. When considering Ally Bank against the competition, it’s really no contest. On a one-year CD, Ally Bank CDs boast an APY of 2.75%. Compare this to top competitors like HSBC Advance (0.95% APY), Bank of America and Chase (0.05% APY and 0.02% APY, respectively). None of its competitors offer rates even half as attractive as those at Ally Bank. When it comes to five-year CDs, Ally Bank offers rates of 3.10% APY. Compare to Chase (1.21% APY) and Bank of America (0.15%). On all common CD terms, Ally Bank is the most attractive option when considered from the point of view of APY. 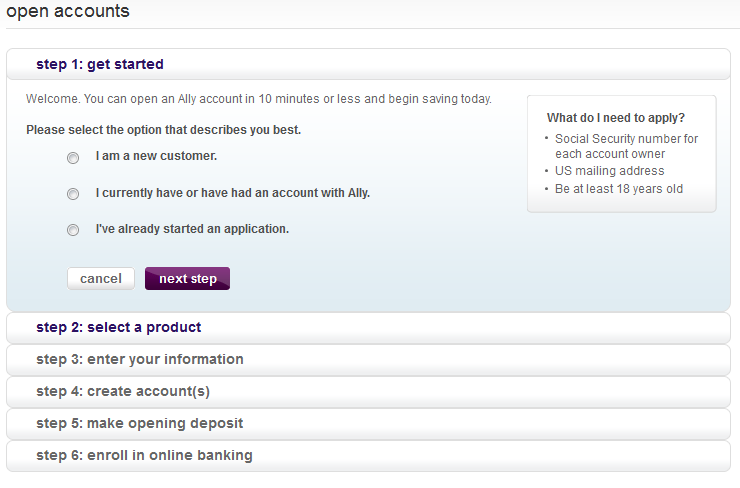 Ally Bank only charges fees for one reason: withdrawal before maturity of the account. For every type of CD with Ally Bank, the penalty is equal to the amount of interest the CD would have accrued over a period of 60 days. The penalty first comes out of the interest and then the principal, if necessary. However, this penalty is waived for clients who have passed away or been declared mentally incompetent. Account holders who must make a Required Minimum Distribution (RMD) for an Ally-held IRA have the fee waived as well for up to that amount. Ally Bank also offers “no penalty” CDs, for which there is never any penalty for an early withdrawal. The Ally ten best day rate guarantee allows you to get the best rate in the ten days surrounding the time when you put money into the account. The Raise Your Rate CD allows flexibility and the ability to increase the rate of your CD as rates improve throughout the broader market. Ally makes it simple and easy to get the money from your CD once it has matured. You can call, chat with a customer service representative or just use regular mail to notify Ally that you want your money after maturity of the account. Do this during the ten-day grace period following maturity to avoid a penalty. After this period your certificate of deposit will automatically be renewed by Ally. High Yield CD: Comes in terms of between three and 60 months. Raise Your Rate CD: Available in terms of four years and two years. You can raise the rate on your CD simply by logging in to your Ally account and choosing “raise now.” Your rate will then be raised to whatever the going rate is for CDs that day. No Penalty CD: This CD offers a term of 11 months. There is never a minimum deposit on an Ally CD, making these an attractive option for any budget. You may not make any additional deposits to the CD account during the term. However, you are welcome to contribute more to the CD once it has matured during a ten-day grace period after the renewal. Opening an Ally CD is quick and easy. You can submit an application through Ally Bank’s website. You can also download a form from ally.com and mail it in through U.S. mail. Finally, you can talk to an Ally Bank customer service representative on the phone who will guide you through the application process. With great rates, no fees and flexible options, the Ally CD is an attractive choice for all individuals looking to make the most out of their money. Find out how much you need to open a CD account.